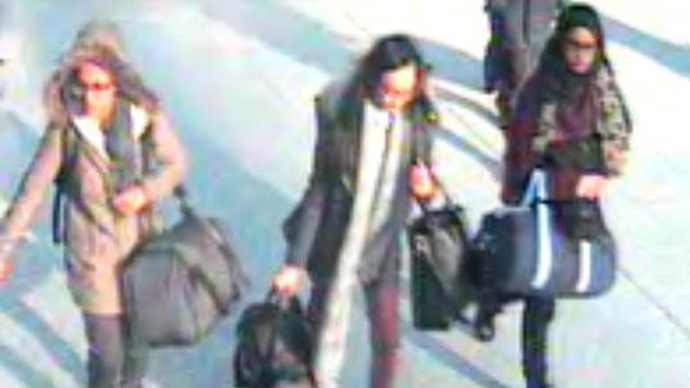 A London court has issued travel bans for five teenage girls who study at the same school once attended by the three girls who fled England last month to join Islamic State fighters. The family division of the High Court in London issued the bans last week, declaring the teens wards of the court in order to prevent them from running off to Syria. An application for the travel bans was filed by social services in the London borough of Tower Hamlets after the girls reportedly showed an interest in moving to Syria following the disappearances of Kadiza Sultana, 16, and 15-year-olds Shamima Begum and Amira Abase. The five girls, whose names are not being released, are now barred from traveling abroad without a judge’s permission. The judge removed a previous order which forbade identification of the school, after the Press Association news agency argued that it would be “in the public interest” to reveal that the eight girls attended the same school – Bethnal Green Academy in East London. Barristers for Tower Hamlets Council and the Metropolitan Police argued that naming the school would risk revealing the teens’ identities. Bethnal Green Academy said it barred access to social media on its campus and that radicalization did not occur within the school's walls. Islamic State extremists have been conducting a successful recruitment campaign, luring young people of both genders to Syria and Iraq. Last Friday, three teenage girls were detained in Austria after making plans to leave for Syria where they intended to marry Islamic State militants. They had made contact with representatives of the Sunni extremist group via Skype and other social networks. British MPs warned earlier this week that the country is on “cliff edge” as more men, women and children prepare to flee to Syria and Iraq to join the Islamic State under the influence of the group’s aggressive social media operation.